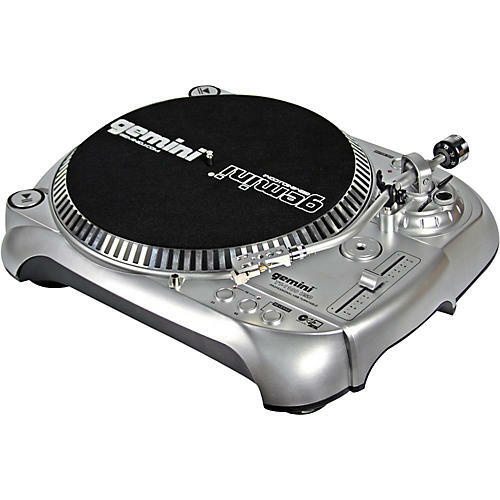 The Gemini TT-1100 USB is a fully manual belt-drive DJ turntable with a solid aluminum platter on a sharp battle/club design. It has a fully adjustable counterweight and anti-skating controls, and a MOTOR OFF/ON button for slower braking, ensuring smoother braking of your favorite vinyl. It can handle 33/45/78rpm vinyl with reverse playback capability. The Gemini TT-1100 turntable has line-level RCA outputs (with built-in pre-amp) as well as USB computer connectivity for both PCs and Macs so you can turn your old-school records into digital MP3s with the help of the included Audacity recording software. The Gemini turntable also features a +/-10% variable pitch slider, and comes with a 45 adapter, CN-15 cartridge, felt slipmat, and detachable RCA and ground cables.